Yesterday was the perfect sunny day for my guided tour with the East Haddam Garden Club at the The Garden Barn Nursery and Landscape in Vernon, CT.
As I drove to the nursery to meet my group, I felt very cheerful because the sun was shining, there was no wind, and the birds were chirping. When I arrived, my group was waiting for me in the garden center with big smiles. I immediately felt their excitement of getting their planned insider’s tour of the Garden Barn for their first time. Many times, when I do my design reviews with clients, they will ask me where to shop for the plants. I always answer this question by telling them what I think are the best attributes of the local nurseries in our areas. And, I have to say, one of the big benefits of The Garden Barn is they have it all. What I mean is they have the “Greenhouses + Garden Center + Nursery + Growing Facilities + A Pond Garden + Gift Shop.” This equals to me, everything you’d expect, which is one of their mottos at The Garden Barn. We started our tour by taking a look at their gift shop – I like that they have a gift shop where many centers do not. 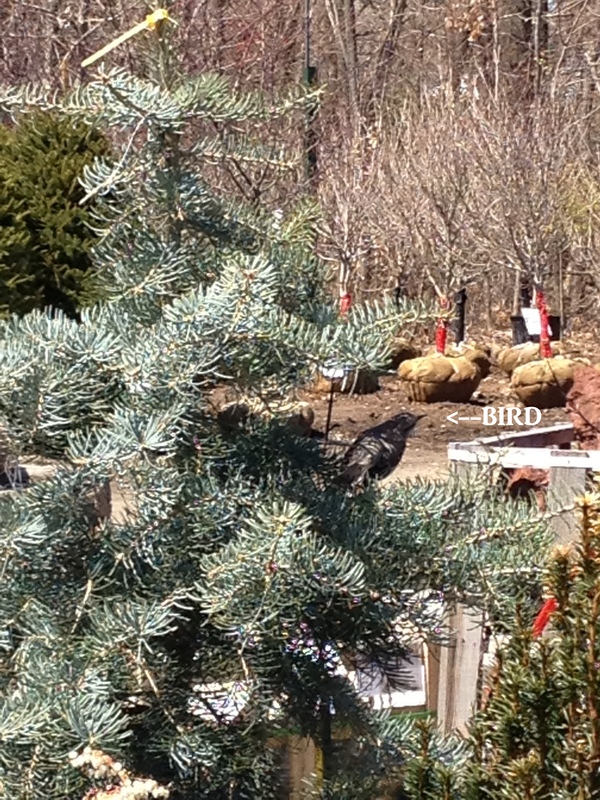 It was filled with bird features, seeds, and dried florals, and much more. One of the garden club members walking this tour noticed a beautiful glass bird bath, and at the end of the tour, she carried it right to the register. It is nice when you are out shopping for plants to have the option to buy a gift at the same time if needed for yourself – or for someone else. As part of this tour – this group got a bit of the “insider’s info” as I told them about my experiences working there in 2006. And the owners, Kathy and Dennis, shared their history, experience, and talked about the new areas of The Garden Barn with the tour group as well. We walked through the back warehouse, not visible to regular customers, and as I was walking and talking, Kathy came to greet us. Her name is Kathy too (with a K). This prompted me to tell the group the reason I called my business Cathy “T’s” Landscape Designs is because when I worked there – my name was confusing at times. If someone called out Cathy on the walkie-talkie, they may have meant Kathy, the owner, not Cathy the staff member, so we decided to use Cathy T and it just stuck with me. 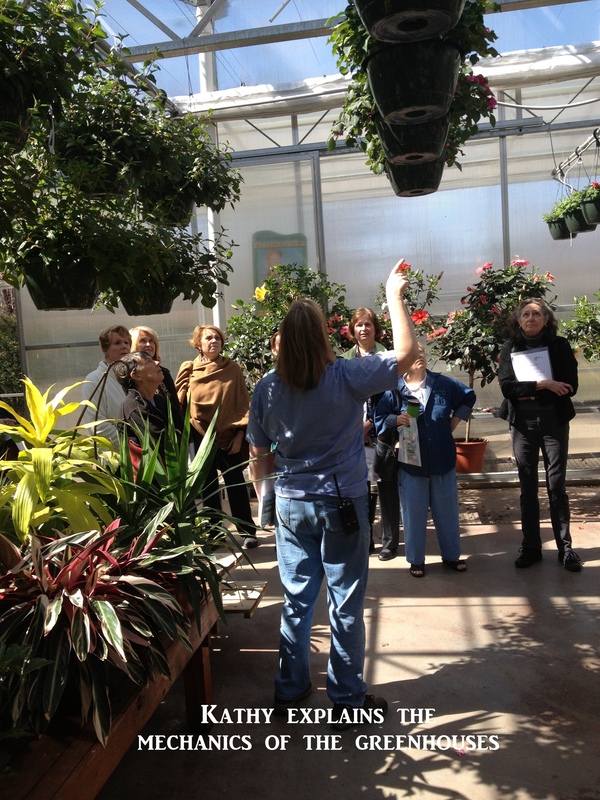 Kathy shared her experience, history and details about the operations at their nursery. And then we continued through the greenhouse looking at the annuals being put out on the tables. 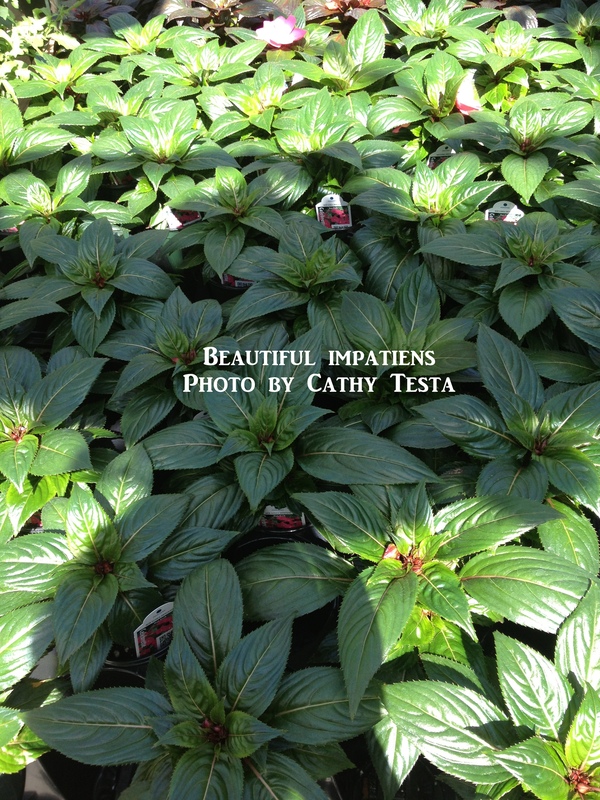 There were some beautiful, healthy new guinea impatiens sitting there just waiting for their new owners. These are not infected with the blight experienced last year, which many people encountered. Kathy gave advice on what do it “if” they had the blight on their plants, but the good news is their new stock is free from it. The Garden Barn was established in 1980, and it started as a small “road-side stand.” It is incredible to see how much they have grown into a 13 acre facility, with a new addition in 2010-2011 of an open-air pavilion of 11,000 square feet. As I walked the group outside to see the new addition, I told them the old one was wooden and made a lot of noise on windy days when I worked there. Sometimes people would look up and wonder – will a panel fall off?! Now it is a beautiful structure filled below with shrubs and trees. 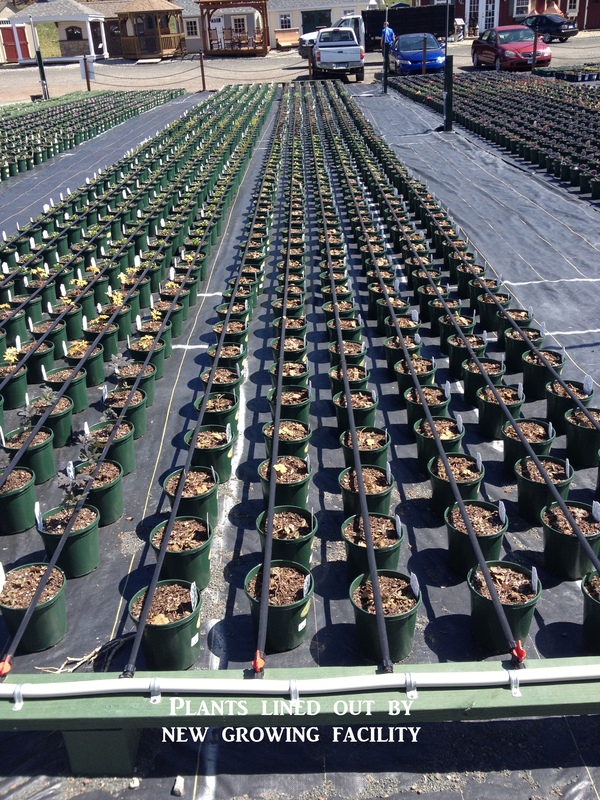 There are several new growing facilities now too. A head-house and poly houses, along the back side of the property. Kathy told us to go visit Dennis, that he was expecting us. She referred to the new facility as his retirement home, cause he always in there. But when we arrived, Dennis told us his name for the new dwellings – The Rehab. I can see why; it is warm, beautiful, quiet and relaxing – and FILLED CHUCK FULL with beautiful plants and hanging baskets. It was a special treat to enter an “employee’s only” section of the nursery – which you didn’t want to leave because it is tranquil in there and just has a certain feel – at least for plant lovers! Dennis told us anytime he calls out on the speaker, “Who wants to work in the Rehab today?” he is not short on volunteers from his crew and staff. They run at the chance. The new facility is on 3 quarters of an acre, but you know what? Dennis said, he would have bought more property if he could. I joked, “Hey how about a Garden Barn restaurant? !” He replied with, “More like growing grapes.” Hmmm, even better I thought. Either way – there would be wine (hee-hee). After we toured the new growing areas, we went back to the large areas of trees, shrubs, perennials, ornamental grasses, and more. I’m just in awe of how a couple and their children have made The Garden Barn a show-stopper, and worth a trip – even all the way from East Haddam. 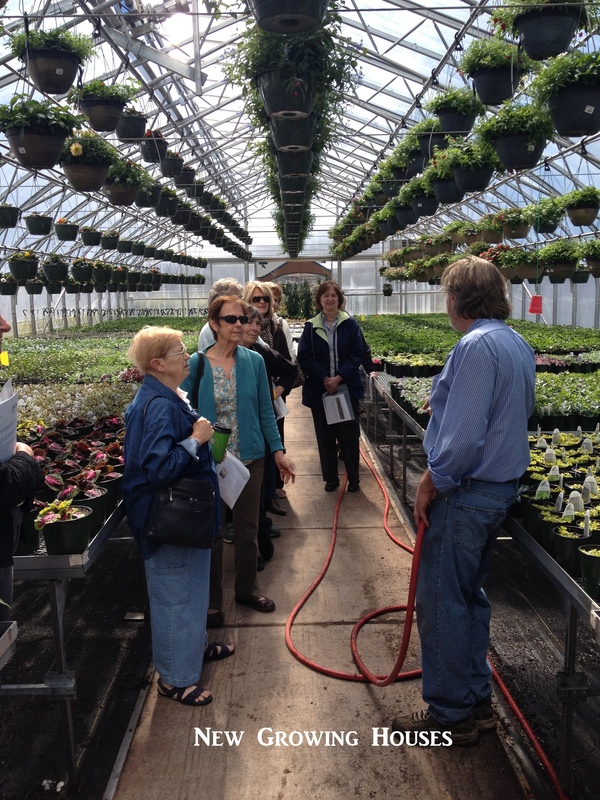 This garden club did not regret hitting the road for the day to see a nursery outside of their town. The best part of the day was seeing the abundant plants lined out and being hardened off for spring – and the sizes and quality, in my plant eyes, are outstanding (as usual for The Garden Barn). This is another benefit about The Garden Barn – they have full plants and they stand behind their plant warranties. They are also part of CNLA, the Connecticut Garden Trail (ask them about this), ANLA, and the Tolland Chamber of Commerce. The Garden Barn in Vernon, CT was a great place for me to learn when I started in my career change several years back. It takes hard work and a true passion to maintain and grow a place like The Garden Barn. Overall, the day was beautiful, filled with beautiful plants (and I’m not kidding about the birds, they were chirping around us as we walked), and the group from East Haddam was a beautiful group of ladies who truly enjoyed the special treatment and guided tour. And P.S. : I made it out of there without buying anything – but I really wanted one tree in particular I saw there – and I’m thinking of calling today to order it. I can’t stop thinking about it. ← A little bit of pink. Cathy these ‘behind the scenes’ tours tours sound wonderful…hope someday I am able to attend one!